Belgium has never been known as a hockey hotbed. For women and girls especially, it is incredibly difficult to even obtain opportunities to play the game. Great strides have certainly been made in the North American leagues, the NWHL and CWHL – we still have a ways to go, but “Grow the Game” is as strong as it has ever been. But, with the possible exceptions of Sweden, Finland and Russia, you have to recognize too that there is a level of disparity between those aforementioned leagues and countries, when compared to a smaller nation such as Belgium. An immense passion – one that is often encompassed by some hardship as well – needs to be had in order to play the sport regularly and to stick with it. For the Belgian players who love the game, they make due. Thanks to a young player – Valentine (Val) Maka – there is at least a strong flame to keep the passion burning for players in her country. 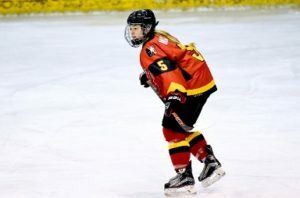 THW spoke with Maka at length so that we could get a better sense of what women’s hockey in Belgium is all about, and so that we could spotlight a player who is certainly turning some heads in her own region. Perhaps she may even catch the attention of one of the professional leagues. What is rather impressive to note is that Maka has not be playing hockey for very long. At the time of this interview, she is all of 23 years old and has many years left to play. In most instances though, perhaps especially in North America, a hockey player might start skating before they are even in kindergarten, and then eventually begin playing organized hockey once they reach grade school ages. In the case of Maka though, she did not begin playing until much later. Since that time hockey has carried her quite far. Consider if you will that even though she began playing at 15, Maka has already played for the Belgian national team in six different IIHF Women’s World Championship tournaments. Not only is that a testament to how she has progressed as a player, but it confirms her aforementioned statement of how badly she wanted to play. It is rather profound to go from being a novice teenager to representing your country. Like many hockey lovers, Maka finds inspiration from today’s contemporary stars from both the men’s and the women’s sides. Particularly in women’s hockey, she recognizes that the premier faces in the game are able to cross borders and encourage young players from a wide variety of nations. Belgium is a nation with a population of over 11 million people. Many will know the names of the larger cities in the country, such as Brussels or Antwerp. Outside of the larger cities though, other areas of Belgium are not well known in North America. Maka hails from one of those smaller parts of her country. For any hockey players who may have grown up in small towns among the Canadian plains, you might be able to feel some common ground with her. Shortly after Maka began playing hockey, she had the opportunity to travel and play the game in one of the most hockey-passionate cities in Canada. If nothing else, it only fueled her love for hockey even more. Her commitment to the game in her own country was accentuated tenfold. Follow closely to what Maka says about the rather limited opportunities she has to play the sport she loves in her homeland. Her own commitment to a sport with very limited opportunities at home seems to echo her own sentiments about what Knight has been able to achieve. It may also make you feel thankful for your own hockey opportunities. While she still plays on boys teams from time to time, Maka has been playing with a women’s team – Grizzlys Liège – since she returned from Canada. For many years it was the lone Belgian women’s team, and the squad competes in a German women’s league in order to participate in league play and compete for a championship. You make do with what opportunities you have. For the 2017-18 season, Maka led the Grizzlys Liège in goal scoring, and finished second on the team in points. Her 24 goals in 15 games were the second most in the entire league behind the Hannover Indians’ Bettina Evers’ 26 tallies. Maka’s 37 points tied her for the fourth highest total across the league. The compositions of both the Grizzly Liège team and this lower-tiered German league as a whole are rather interesting. The Grizzly Liège has played in the Germany-3 League for two years straight. In each of those years, Maka and her teammates were runners up for the championship. Likewise, The Grizzly Liège is the only non-German team in their division, named the Landesliga NRW division. The level that Maka and her team are presently playing at is something that she hopes to see improve as time goes on. Since those first tournaments, Maka has since competed in two Division II qualification tournaments. Individually she has played quite well too. At the 2017 qualification tournament in Chinese Tapei (Taiwan), she scored her first two goals in international play. Belgium would finish in second place at the tournament, while Maka was one of six players to score at least two goals for Belgium in their four qualifying games. In the most recent 2018 qualification tournament, she scored three goals in four games and finished as a plus-5. Two of Maka’s goals came during a 9-0 shellacking of Bulgaria in their first game of the tournament. The only unfortunate aspect is that in neither instance did Belgium win the qualification tournaments and advance back into the Division IIB tourney. They narrowly missed out by finishing in second place in both 2017 and 2018. Outcomes aside, her international experiences are something Maka places the utmost value upon. That first international goal of Maka’s came during an 8-1 victory over the Republic of South Africa at the 2017 qualifiers. Along with her ability to score and generate offense, Maka’s best attributes are her work ethic and her character. She plays at her best while under pressure and when confronted with adversity. This has a lot to do with how she has stuck with the sport she loves, despite any difficulties that could have potentially dissuaded her. Perhaps there is a CWHL team or an NWHL team who would be willing to give Maka a shot? She is in her early-20s and has completed her studies. What better way to grow and support the women’s game than by providing opportunities to players overseas. Heading into the 2018-19 NWHL season, there have already been a couple European signings with the first Czech (Katerina Mrázová, Connecticut Whale) and first Swedish player (Michelle Löwenhielm, Connecticut Whale) to join the league. Given the right set of circumstances, perhaps an offer should be extended to Maka. It’s certainly something that she has thought about. Teams ought to take note and consider contacting this young lady. She would not disappoint.